The PAFF Eastern Pa. Fly Tying Jamboree on Feb,16 was a great success! We had lots of good tyers from all skill levels. Everyone had an excellent time and it was great to see some old friends and make some new ones. I want to thank Jack Fields for taking all our pictures. We were able to give a very nice donation to the nature center due to the generosity of the people and companies who donated the prizes for the fundraiser. We would also like to thank the good folks at the Lehigh Gap Nature Center for having us at their facility. As an added attraction yesterday, Bill Fretz demonstrated how to make furled leaders. Bill makes fine leaders and it was quite interesting to see how it is done. - Michael Lohman "GenCon"
The event was a lot of fun as usual. Thanks to all the organizers and to the tiers who took the time to share their skills with us. There's a lot of talented members on this forum and it was a lot of fun to get to know so many and get to pick their brains. +1 to Brad's stonefly nymph skills. you'd never know you were so new to tying looking at your work and your presentation to the group. A special thanks to Michael Lohman "GenCon" for leading the organization of this event. Nice job!! Another great video from Tightline Video here in the region. Can you find more video's on tightlinevideo YouTube channel. You are invited to attend and participate in the 2018 PAFF Eastern PA Fly Tying Jamboree, to be held on Saturday, February 17, from 10 AM to 5 PM. This event is being hosted by Michael Lohman GenCon and Rich Mooney, Mooney4. Either of us will answer any questions regarding the event. Please sign up in the forum and ask any questions here. I like to use 6/0 or 8/0 thread for the body depending on the brand of thread and the size of the fly. The body should remain thin like the natural. 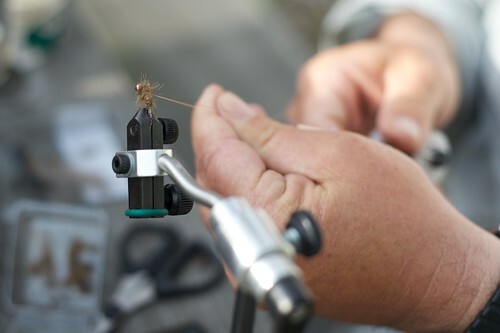 For midge pupa, do the same thread body as above, except instead of wings dub in a small wisp of light colored dubbing fur near the head of the fly or trim a small clump of CDC at the head. Give it a try and good luck. 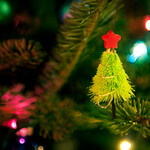 Follow in the forum here. Tails and Antennae-Gold or yellow rubber legs. Round or square doesn’t matter. Barring optional. The Paflyfish Eastern Fly Tying Jamboree is a fun day to get out doing some fly tying with members from the site. Attendees will be able to share in the day tying some of the their favorite flies and also learn from others. Everyone is invited to attend and watch the demonstrations, get tips from the tyers, and have a great time. We particularly encourage beginner tyers to attend, and we'll have beginner instruction set up at a table. All Tools and materials to tie your chosen demo fly. A tying lamp and any extension cords you need – there are an ample number of outlets on the walls behind the tying tables. We'll also be holding a raffle at 5 PM of donated tying materials and fly fishing gear. Any donations to this raffle are welcome, and 100% of the proceeds will be donated to the Lehigh Gap Nature Center, as a "thank you" for allowing us to use their beautiful facility for this event. Please sign up in the forum here. A special thanks to GenCon, Heritage-Angler and Mooney4 who are putting this event together. 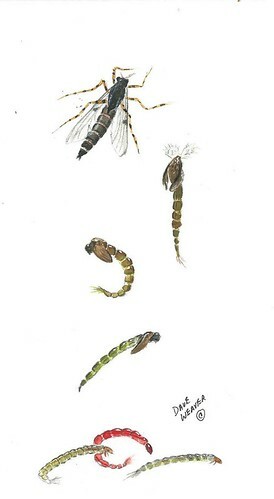 Scuds, or freshwater shrimp, are a staple in the diet of trout. Here in Pennsylvania, they’re associated mainly with limestone streams but in my experience they are widespread in many waters although they are indeed especially numerous in the famous limestoners. Here in the Cumberland Valley I use scud flies year round and rely on them greatly during the colder months of the year. Many scud flies, in my opinion, are tied too bulky and stubby. If you look at scuds, take the time to observe them while they’re actually in the water: they tend to be rather elongated, usually dark olive in color, and they are strong swimmers in short bursts, moving several inches with a strong wiggle motion. Upon coming to rest, they return to the curled shape. Cress bugs or “sow bugs” by contrast, aren’t swimmers and dead drift when dislodged. Many tiers prefer their scuds heavily weighted by I prefer them un-weighted. This seems to work well for me when sight nymphing. When you see a trout rooting in weeds – a common sight on weedy limestoners – they’re usually in pretty shallow water or up high against weed beds. An un-weighted scud can be cast ahead of the fish and won’t plunge down in the weeds and snag. Remember, when flushed out from weeds and cover, scuds will dart. As your un-weighted scud drifts toward the trout, give it a twitch and watch that trout! Anyway, this is a pretty easy fly to tie. Experiment with variations and see what works for you. I like a fairly long tail as scud’s legs stream back pretty far and the long, soft tail helps mimic the scud’s swimming action. On smaller versions, I’ll usually omit the legs at the front. Again, keep the fly fairly slender and dark. If you’re hankering to do some winter trout fishing on limestone streams, fish these guys with confidence. Build a thread body on the shank and tie in a tuft of marabou tips (can substitute hackle or mallard flank) at the eye and a larger tuft at the bend to function as a tail. Tie in about 2” of black, medium size Ultra Wire at the bend to function as ribbing; then tie about an inch of olive rubber material designed as “scud back” or some similar translucent latex. Wrap in a body of mixed olive dubbing with some rabbit guard hair dubbing. Note that scuds tend to be a bit thicker toward the head. Pull the latex over the top of the fur body, tie it off, and then wrap the wire over this to create the segmented blood veins. When done, pick out some of the body fur, especially toward the eye of the hook.